Iron Maiden are teaming up with 50 UK pubs to ce1ebrate their 2nd anniversary on Saturday, May 9. Customers will receive a free Trooper button badge with every pint, while supplies last. 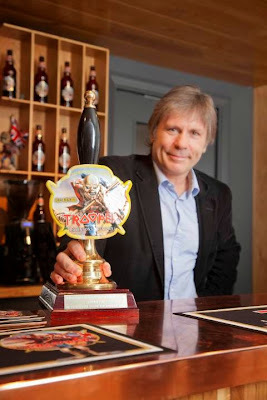 Named after one of Iron Maiden’s most popular songs, the beverage was personally designed and developed as a top quality Premium British Beer by singer Bruce Dickinson in tandem with Robinsons Brewery Head Brewer Martyn Weeks. Trooper Beer sold more than 5 million pints in its first year. Iron Maiden recently remastered 19 albums from their catalog for iTunes. The project sees the band re-master all 15 studio albums, 2 Best Of collections and 2 live albums from their original analogue sources exclusively for iTunes.